Magritte made four versions of this work, “L’Avenir des statues” (‘The Future of Statues’), in the period 1933 to 1937. 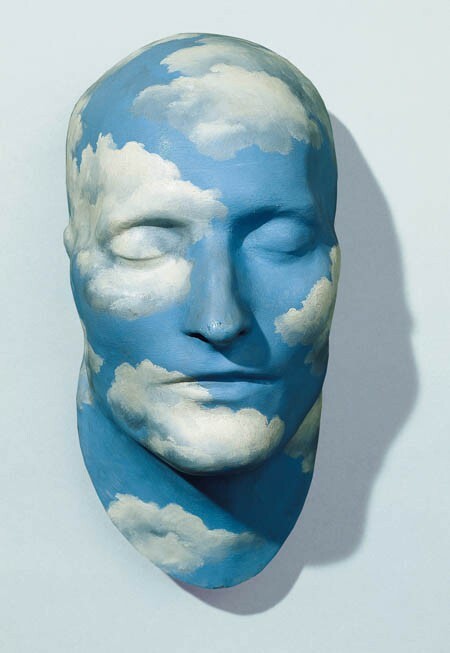 He took a commercial plaster version of Napoleon’s death mask and painted onto it a deep-blue sky spotted with sunlit clouds. According to David Sylvester, it is only the polish on the plaster and the density of the clouds which makes relative dating possible. The title, invented by the poet and philosopher Paul Nougé and not the author himself, says little concerning the artist’s intentions. That being said, the fact that the piece is a plaster death mask of Napoleon, painted like a “ready-made”, poses the question (implied by the title) of the sculptural quality of the object. The fact is, there are several versions of this mask, and none of them can be considered as the imprint of a natural object, since the features of the corpse were idealised post factum with a view to the mass-reproduction and diffusion of the mask. It is these corrections performed on the mask used by the artist which bestow on the mask its status as a sculpture. As for Magritte, however, since he did not produce the plaster in his atelier, he did indeed “paint a ready-made”. His contribution was limited to the painting, and the title invented by Nougé riffs on the Italian tradition of the Paragone, which claimed that painting, by the hand of the artist, would in the end overcome sculpture, a medium here represented by a mass-produced industrial product. This work is part of the temporary exhibition Napoléon à Sainte-Hélène. La conquête de la mémoire, (Napoleon on St Helena, His Fight for his Story) at the Musée de l’Armée, Paris (6 April – 24 July 2016). Oil paint on plaster, signed on the left-hand side "Magritte"